Despite the high utilisation of ureterorenoscopy (URS) in interventional stone treatment, there is little evidence of any link between annual hospital volume and outcome. From January to April 2015, data from 307 URS patients were prospectively recorded in the multicentre observational BUSTER-Trial (Benchmarks of ureterorenoscopic stone treatment-results in terms of complications, quality of life, and stone-free rates). The best threshold value for annual hospital volume with an independent effect on the outcome (measured on stone-free and complication rates) of our study group was established with logistic regression. In 38.4% of cases of renal and 61.6% of ureteral stones, median stone size was 6 mm with an interquartile range (IQR) of 4–8 mm. The annual URS rate in the 14 participating hospitals ranged from 77 to 333 (median 144; IQR 109–208). The binary endpoint as a combination of completely stone-free or residual fragments small enough to pass spontaneously and a maximum complication severity of Clavien–Dindo grade 1 was attained in 234/252 (92.9%) cases with a hospital volume of ≥ 99 URS compared with 43/55 (78.2%) in < 99 URS (p = 0.002). Adjusted for patient-, stone- and physician-related factors, an annual hospital URS volume of ≥ 99 increases the chance of an optimum outcome (OR = 3.92; 95% CI 1.46–10.51; p = 0.007). An independent effect of URS hospital volume on outcome quality in the 14 participating hospitals was demonstrated. Threshold values for annual case numbers should be scientifically established irrespective of the considered procedure. The members of the BUSTER study group are listed in acknowledgements section. Martin Schostak and Matthias May contributed equally. Our special thanks to Anne Pohrt and Pablo Pirnay-Dummer for the patient discussion of statistical questions. Members of the BUSTER study group, Andreas Baars, Ulf Balsmeyer, Maximilian Burger, Matthias Claas de Boer, Gerhard Danzer, Thorsten Ecke, Thomas Enzmann, Dirk Fahlenkamp, Sebastian Filter, Hans Martin Fritsche, Christian Gilfrich, Steffen Hallmann, Joachim Hebert, Bernd Hoschke, Toni Huber, Steffen Lebentrau, Mike Lehsnau, Matthias May, Arkadiusz Miernik, Philippe Fabian Müller, Julia Peter, Markus Porsch, Soeren Promnitz, Markus Rodat, Wolfgang Schmidt, Frank Schoeneich, Martin Schoenthaler, Martin Schostak, Steffen Weikert, Peter Werthemann, Ingmar Wolff, Heiko Ziegler. None of the contributing authors have any conflict of interest, including specific financial interests or relationships and affiliations relevant to the subject matter or materials discussed in the manuscript. 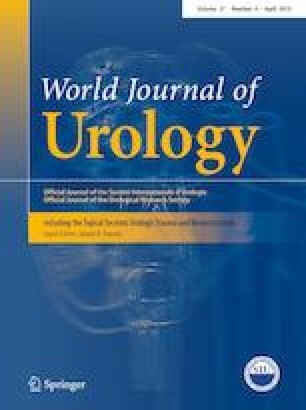 We affirm that all authors have complied with the principles of the World Journal of Urology regarding ethical responsibilities of authors and compliance with ethical standards.